Big Leaf Maple Burls: for turning,box building etc. Big Leaf Maple as a regular wood, from the west coast of N.America, is very similar to the standard sugar maple found on the east coast, as a burl though it is very distinctive. 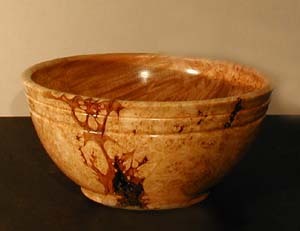 These burls have consistent curly figure and numerous bark inclusions which can create interesting small tunings. They are great to cut into slices for clock making, or thin slabs for beautiful box tops.